Outfielder Ichiro Suzuki #51 of the Seattle Mariners is introduced prior to the game between Seattle Mariners and Oakland Athletics at Tokyo Dome on March 20, 2019, in Tokyo. (CNN) - The cheering began well before the Japanese "god" reached home plate. It was the top of the third inning in the MLB regular-season opener between the Seattle Mariners and Oakland Athletics at the Tokyo Dome, and Mariners shortstop Tim Beckham reached first base on a single. But the roars from the crowd likely weren't all for him, as an all-time great was on deck. 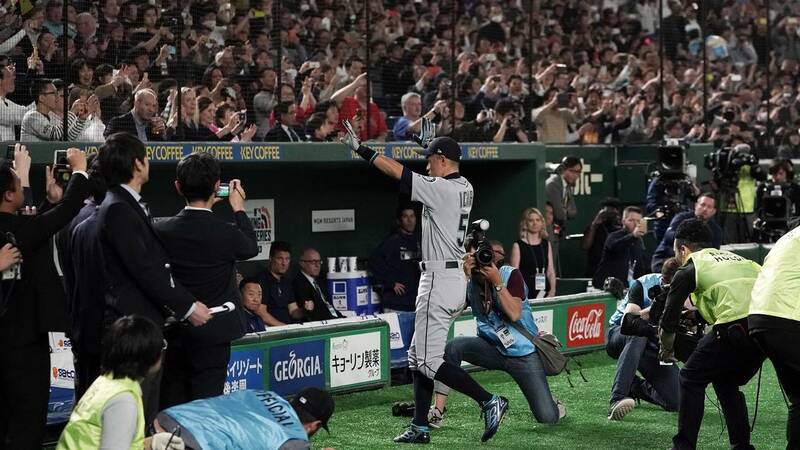 The applause rolled on, as fans pulled out their phones to capture images of Ichiro Suzuki making his way to the batter's box. His stat line from Wednesday -- a pop out and a walk in a 9-7 Mariners win -- won't be remembered as much as the fans' adoration of a superstar. The Mariners, in a tweet, had a single word: "Unforgettable." "Mr. Ichiro," Chicago Cubs pitcher Yu Darvish said in a recent story with ESPN, "is like a god in Japan." Said Yankees pitcher Masahiro Tanaka, also quoted by ESPN: "He is a legend in Japan." At 45 years, 149 days old, Ichiro is the oldest player on the Mariners Opening Day roster and the oldest position player to start an Opening Day in American League history. However, after this two-game series in Japan concludes, it's unclear what Ichiro, entering his 19th season as a major leaguer, will do next. Last season, Ichiro returned to Seattle, his first major league team, and hit .205 in 15 games before he transitioned to the role of Special Assistant to the Chairman for the club. He struggled in this year's spring training, going 2-for-25 in 12 games. But it's all but assured he will be honored one day in Cooperstown, New York, the home of the National Baseball Hall of Fame. And in the present, fans and players are soaking in his presence. "I'm excited for him," Mariners manager Scott Servais said ahead of Wednesday's game, according to MLB.com. "It hasn't been a great spring training for him offensively. But if there's anybody who can turn it on for a few days, it's certainly Ichiro." Ichiro's pro debut came with the Orix Blue Wave of Japan's Pacific League on July 11, 1992, before six of his current Mariners teammates were born. He played in Japan from 1992-2000, winning three consecutive MVP awards and seven straight batting titles. In 2016, he reached rare company in MLB history when he recorded his 3,000th hit. To date, there are 32 players all time to have reached that mark. He ranks first in Mariners' franchise history in batting average, hits and steals. Overall, he has 4,367 hits between his career in Japan (1,278) and the Major Leagues (3,089). On Wednesday, despite popping out to second on his opening at-bat, Ichiro received a nice ovation for his effort. He walked in his other plate appearance, which came in the fourth inning. When he exited the game from right field later that inning, he received more love from the crowd, as a smiling Ichiro received several hugs from this teammates while A's players applauded from the opposing dugout. Down in the camera well, another baseball legend, Hall of Famer and Mariners great Ken Griffey Jr., was in attendance, seen taking photos of the Japanese superstar. With Wednesday's start, Ichiro became the third player to make 13 Opening Day starts with the Mariners, joining Griffey (13) and another Hall of Famer in Edgar Martinez (15). With Ichiro and Yusei Kikuchi being named to Seattle's roster, the Mariners have had a Japanese-born player on their active roster in 22 consecutive seasons, dating back to 1998.